In the Holland Park/Notting Hill borders, close to the junction of Clarendon Road with Clarendon Cross. View property map. 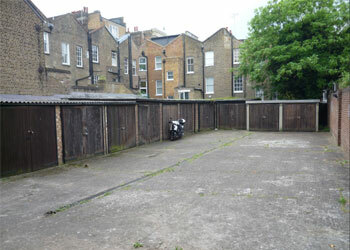 Individual lock up garages within two gated areas, behind residential properties. No water or power. Typical approximate dimensions as follows. Please note that a there is a height restriction on the entrance to the garages at 79 Clarendon Road (shown in photograph). Flexible agreements with a mutual rolling option to terminate on two months notice (minimum term 4 months) at £300 per calendar month.